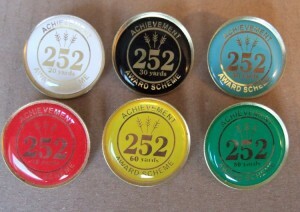 Aim4sport AC is keen to encourage all members to develop their archery and have therefore introduced a 252 Award Scheme. 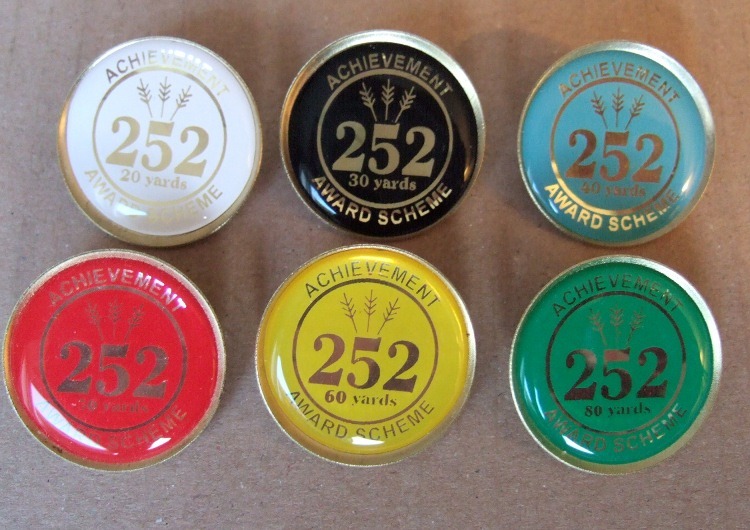 The 252 award scheme is designed to help you practice your shooting at different distances and recognise your achievements. After 6 sighters, you shoot 3 dozen arrows on a 122cm face at your chosen distance. The round can be shot at 20, 30, 40, 50, 60, 80 or 100 yds/meters. With the aim of scoring 252 or better (alternative scores apply for other bow types). If you achieve the score twice you can claim a badge. It is an award scheme in use at many archery clubs in the UK and applies to all archers, irrespective of age, ability or bow type (scores differ by bow type). Six sighters to be followed immediately by three dozen scored arrows. 5-zone scoring (Gold = 9, Red = 7, Blue = 5, Black = 3, White = 1) using a 122cm target face. Badges must be claimed in sequence. To make an award claim 2 signed and witnessed score sheets needs to be submitted to the club’s Records Officer. Badges will be presented to successful archers at a club competition following submission of 2 scorecards, or can be collected from the records officer if unable to attend the competition.